Overlanding is gaining popularity in the camping world. Hiking through unexplored trails or riding your bike through amazing landscapes is quite an experience. But this type of adventures requires many important “toys”, mainly one: Roof top tents. A rooftop tent is a gear that offers you to explore and enjoy your trip in a different way. They are a simple gear that fist onto your car’s roof to keep you safe or dry compared to sleeping on the ground. Using rooftop tents over your car is a fast way to set up camp in the wild and is also great for road trips for you can sleep in peace. Depending on the season you want them for, they come with a soft or hard shell or even a mixture of both. If you are a camper in search to change the way you camp and want to find the best roof top tent that will suit your needs when you travel, we’re here to help. This type of products are the ones that can completely change your camping life and will help you have more fun in the outdoors. As usual, there are too many options so picking the option that suits your needs the best turns into a problem. So you need an expert advice. That’s why we’re leaving you here the list of our top recommendations as a guide so you may enjoy the outdoors with your family. Coming from Australia this may not be the cheapest tent in the market, but it gives you your money’s worth as it provides ease and convenience when traveling. Its standard design is made from high quality and resistant cotton and polyester, it offers good ventilation. It includes a built-in rainfly, laminated PVC cover for driving and has screened doors and windows so you won’t have to worry about water dropping, insects bugging you at night or strong wind. Its driving cover resists UV rays so it won’t break. It also has an improved zipper, with three straps to secure it. The item also includes a bonded, high-density foam mattress with a removable cover that will ensure your comfort. It is equipped with a retractable ladder that is made of thick aluminum that never rusts. 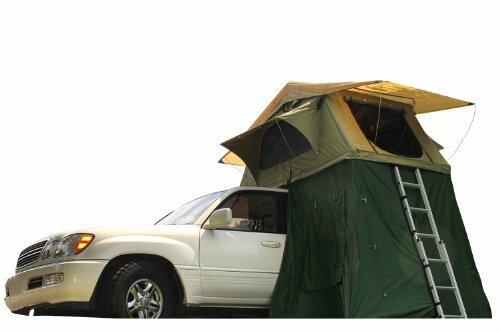 The tent can be mounted the tent on either the rear, the front or side of your vehicle. No problem if it is a truck, a van a Jeep or even a trailer, it has an easy setup and it can be easily packed away, with the bedding kept inside to save space on your vehicle. Camco is one of the most popular, and a front runner brand of camping tents for car camping and accessories. Enjoy a safe camping experience without spending so much in your next expedition with this innovative tent. This model is the perfect roof top tent if you are conscious of your budget, and it has received great feedback from its users. It weighs 130 pounds and measures 59x49x12 inches when packed. It quickly mounts to most load bars or roof racks of vehicles and includes wrenches, poles and mounting brackets for easy set-up. You can configure the tent to set up on the right, left or rear side of your vehicle or mount it to a trailer. Durable and comfortable, the high-density foam mattress holds up to three persons and your equipment. Built for all seasons, it has a rainfly raised above it to keep it cooler in the warmer climate of summer. The rain fly also helps to reduce condensation during winter and maintain an overall breathable environment. It has mesh screens and doors to keep away bugs from the interior. It’s worth spending a bit more on a tent that will let you enjoy the outdoor life in style. This one boasts high-quality materials and features that make it an all-season shelter, allowing you to camp any time of the year without having to worry about warmth or cold. It has the capacity for 3 people and has one door. It’s equipped with two zippered panels on the roof, allowing you to enjoy the stars at night. The tent looks intimidating, but it’s not hard to setup and installs. 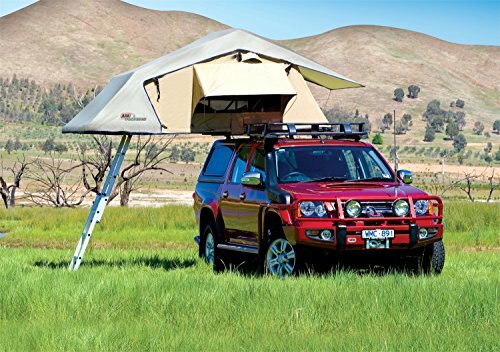 Its design comes with brackets that attach to almost any roof rack and bars, supported by a sturdy aluminum frame that can endure strong winds. Inside, sleep comfortably on a high-density foam mattress that feels like you are resting at home. In case the rain pours, the waterproof fabric sheds raindrops satisfactorily. This one may be low in price, but not in quality, so it’s not surprising to see it included in the top rooftop tent reviews. If you don’t want to spend too much, this is an excellent choice. 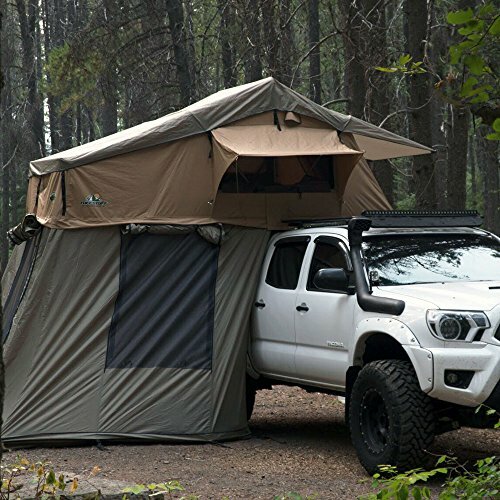 Tuff Stuff Ranger is a great option as it features an annex room and black driving cover, providing ultimate comfort and convenience when going to your camping location. It unfolds in minutes and takes no tools to install. It is made of an aluminum frame, rack mounts, and ladder. They definitely guarantee durability: you’re sure that no rust can ruin it after years of use. The high-density foam mattress and bedding can be stored inside to free up valuable space in the vehicle. 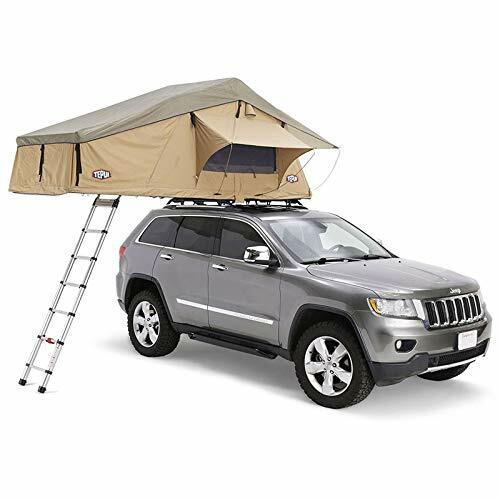 Its ladder, tent surrounds, and the roof rack is all made of lightweight aluminum, which is less heavy than steel. Its fabric is a 280gram rip-stop of a polyester and cotton mix covered with polyurethane to resist dense rain, rust and UV rays. Also, the sleeping space can accommodate up to two persons with their sleeping bag, while the annex room has a polyester floor and can fit a queen size bed that sleeps up another two people, cot or mat so you may rest comfortably. You can even place a small dining table or use the spare space for your gear if you’re not traveling light; it’s all up to you. Now, another product from Tepui Autana, one of the leading brands in America. One of their distinctive features is their variety of prices and models. If you want to purchase one of the best rooftop tents, it will come at a higher price range. This one is worth every dollar and will be an amazing upgrade. It is made of high quality UV and mold resistant awning material with PU coating and taped seams. It fits up to 3 peopleand leaves enough storage area to store your gear kit safely, which is handy when you carry sports gear with you. Its weight is 240 lbs and is great for any season and weather. This is because it has 360g poly-cotton canvas that is waterproof, breathable but protecting enough for cold weather. Designed for dirt roads, it is made with a reinforced construction that handles everything from heavy snow and rocky forests to miles in the desert with hot weather. It can stand the most extreme environments thanks to its coated ripstop. This makes Ruggedized the top tent car protection in the market. It has heavy duty hinges, anti-condensation mats and aluminium diamond plate. Its rainfly gives it an extra layer of protection. It folds open for easy installation as it has a universal mounting system to attach to almost any roof rack. Also, last but not least, it even includes a telescoping ladders for unforgettable starry-sky nights. Roof top tents are there if you are not the type who can withstand “real” camping adventure. Therefore, expect them to be pricier than conventional tents, but for good reason, as they offer different adventures for campers. You can use it for long road travels or even on glamping. Check out a roof top tent comparison to avail the one that offers more value for your money or simply the one you want for the next vacation with your kids.